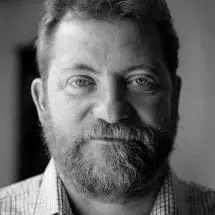 Read Mark Bibby Jackson's adventures walking in Lanzarote, from Orzola in the north to Papagayo in the south, climbing several volcanoes along the way. 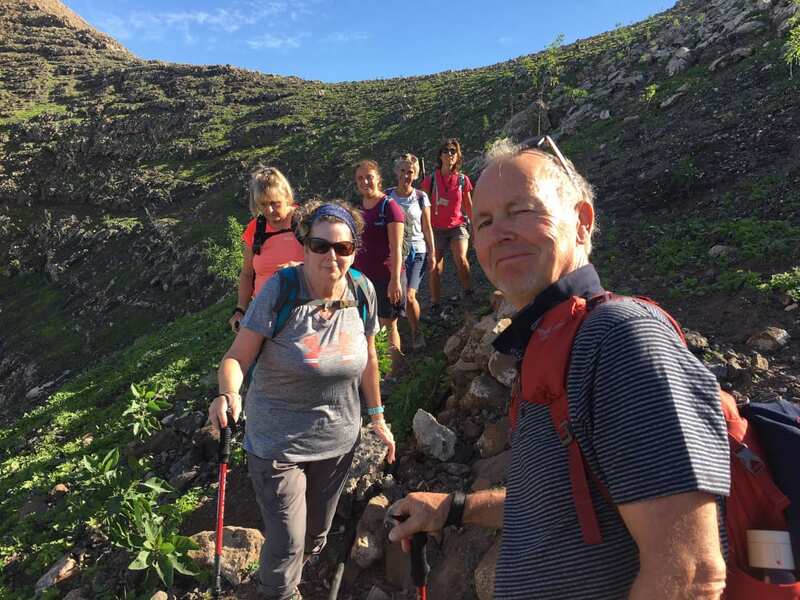 Read Mark Bibby Jackson’s adventures walking in Lanzarote, from Orzola in the north to Papagayo in the south, climbing several volcanoes along the way. The idea of walking the length, or breadth, of an island has always appealed to me. 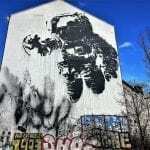 I am full of admiration for anyone who has walked from Land’s End to John o’ Groats in the UK; even the thought of organising such a trek overwhelms me. Which is why when invited by Lanzarote Retreats to go walking in Lanzarote from Orzola in the north to Papagayo in the south, I accepted the offer even before checking how large the island is. This was my first visit to Lanzarote; my solitary previous venture to the Canaries was on a lads’ trip in my early twenties to Tenerife, where the only Spanish I picked up was “dos por uno” normally said in a Mancunian accent outside some dismal bar in Playa de las Américas, in the shameless hours. I am sorry to admit I did little to improve the image of the Brit abroad. Some years older, if questionably wiser, I find myself checking into my eco yurt – another first – at Lanzarote Retreats’ Finca de Arrieta before spending the evening at the excellent and friendly beach-side Casa de la Playa restaurant. There I was introduced to the local gofio escaldado, a maize stew with the texture of a dahl, but a corny flavour. You scoop it up with slices of fresh onion, and wash it down with copious amounts of beer. Perfect preparation for my labours ahead. Fortunately, I am not a complete novice when it comes to taking a hike. 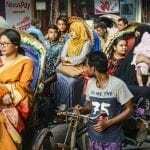 My experiences trekking in Nepal had prepared me for this excursion, although my latest venture ascending 100 waterfalls in Nong Khiaw, Laos had not gone so well. Scanning our motley crew, I felt not totally out of my depth. Although, I was soon to discover that one of the two Lynn(e)s in our group was a compulsive rambler. Still, she had recently celebrated her 70th birthday; perhaps I could keep up. And unlike with my Laos walk nobody had climbed Everest. The only thing I knew about Lanzarote, was it was black and volcanic. So, I was surprised to discover how green the island is. Something my guide Raquel Mazariegos from Blackstone Trek & Tours attributed to recent, unseasonal rain. 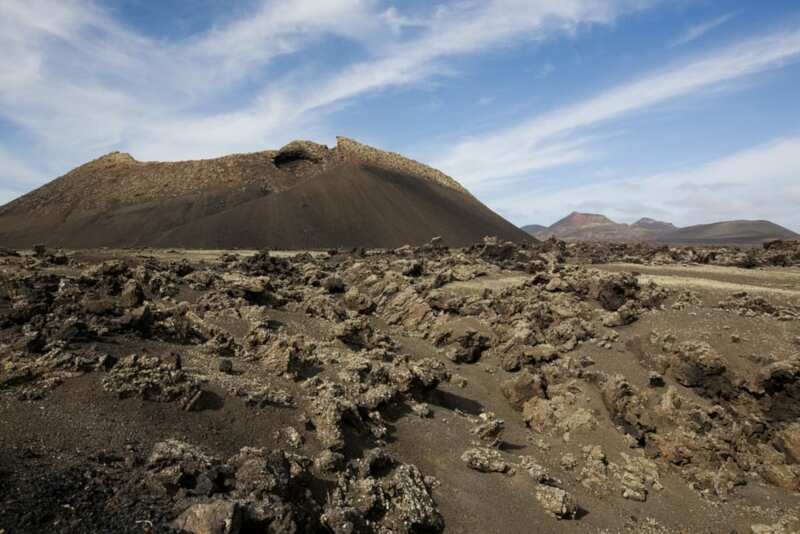 Formed 14 million years ago when an eruption created the south of the island called los ajaches, Lanzarote specialises in volcanoes; it is sometimes called the island of 1,000 volcanoes. Some four million years late a second eruption led to the north of the island or famara rising from the ocean floor. Eventually, the north and south were united, unlike the UK, by a series of eruptions between one and two million years ago. The most recent eruption was in 1824, Raquel recounts. En route to the start of our walk we pass James del Agua, a huge lava tube where concerts are performed every Tuesday and Saturday, with the majestic Corona volcano to our left. 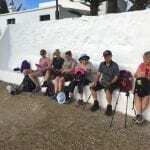 Our first day’s walking in Lanzarote starts deceptively easily with a gradual ascent along el camino de Orzola a Playa Blanca, or GR131 to its friends, which we are to follow for the next few days. 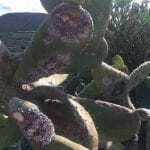 We pass fields of aloe vera and others of cactus on which the cochineal beetle grows. Up until the 19th century this insect provided one of the main sources of income for the islanders, producing a natural red dye that was much sought after around the globe. Now, the island’s economy is almost solely dependent upon tourism, one of two subjects taught in higher education here – along with nursing. Soon we are climbing our first volcano, before lowering ourselves into its now extinct crater to marvel at the vegetation flourishing here. 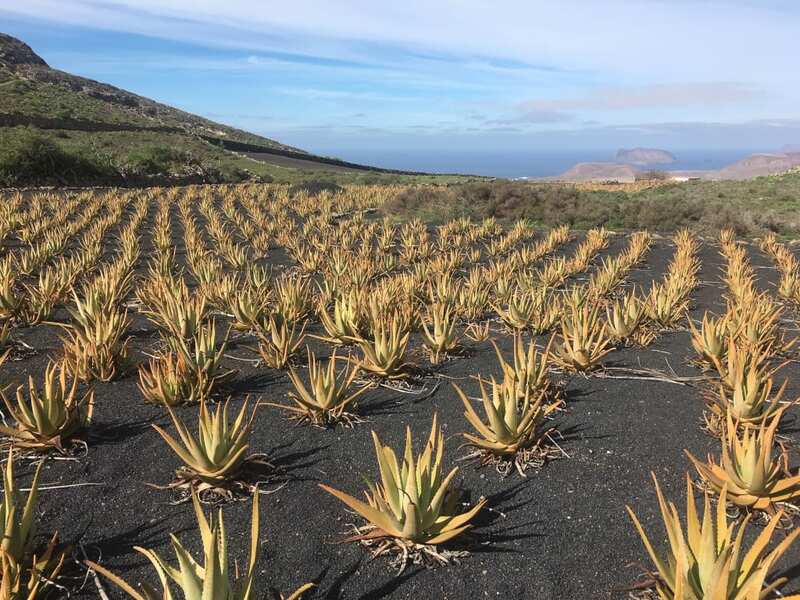 Then, we walk long high and upwards through more fields of aloe vera until we have the most spectacular views back across the small archipelago of five islands just to the north of Lanzarote, of which La Graciosa is the largest. Raquel tries to persuade us that one resembles a turtle but I am not convinced. This was the highlight of our first day’s walking in Lanzarote, which concludes in the small town of Haria, with a most welcome refreshing and deserved beer, after some 18 kilometres of walking. The next day we pick up where we had left off – following a night’s recuperation in my eco-yurt to reboot my flagging body. Haria has been selected as one of the prettiest towns in Spain, along with neighbouring Teguise, which is the destination for today’s walk. Some 16 kilometres separate the two towns – at least as the rambler walks. This being a Saturday, the square at Haria is bustling in the morning as we depart. 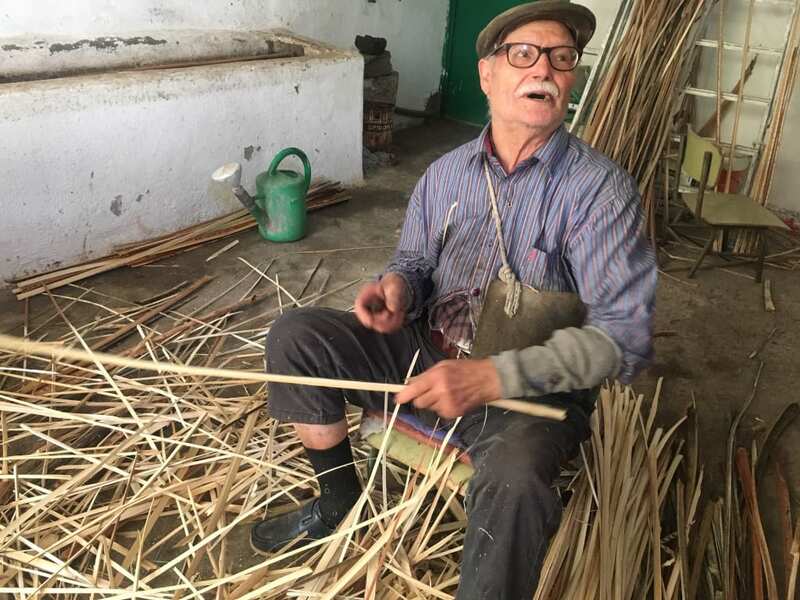 Passing through the town we are introduced to Don Eulogio Concepcion Perdoma, the impressively named weaver, who has been creating baskets from the local dried palm leaves for seventy years; the Don is 88. 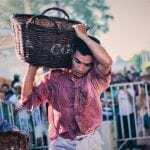 Sadly, the skill is likely to die with him as we are informed he is the last to know the traditional method of making baskets. 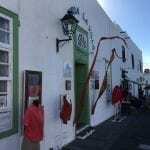 Haria was the home of local architect Cesar Manrique, who is largely attributed with the successful preservation of the traditional white houses on the island. Statues created by Manrique are dotted across the island – often at roundabouts – and a museum established in his former house and displaying some of his possessions as well as containing his studio, commemorates the island’s most revered son. It is next to Don Eulogio’s small workshop. Leaving Haria, we pass through a ravine and along the Valley of a Thousand Palms – although the number seems as arbitrary as the volcanoes – before we climb up to the top of Famara Cliff. The 22-kilometre-long, 500-metre-high cliff walls afford spectacular sweeping views across the north of the island and down to the beach at Famara. 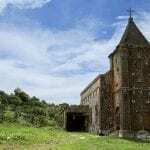 We decide to take our packed lunch outside The Sanctuary of Our Lady of the Snow church adjoining las Penas del Chache radar station, which is the highest point on the island, some 671 metres above sea level. 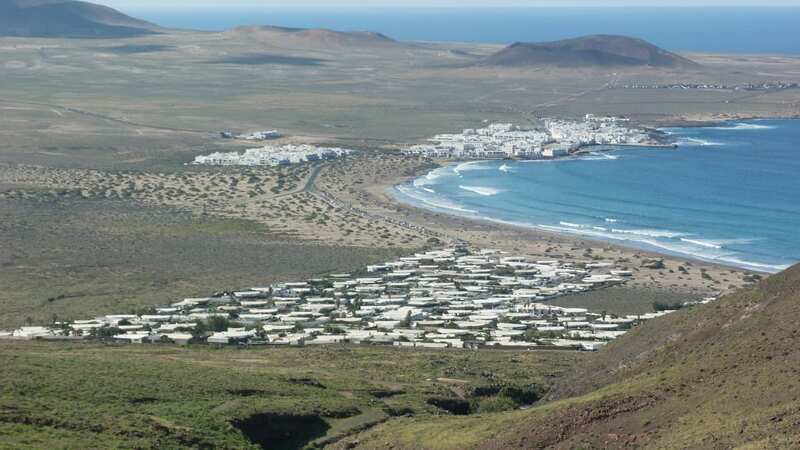 From here, it is a relatively easy walk down to the beautiful town of Teguise, which was the capital of Lanzarote until 1852, and contains the oldest street on the island. There is a sense of déjà vu about the start of the third day’s walk; a beautiful white village with a morning market. Although Teguise’s Sunday market is much more expansive than Haria’s local affair. Merchants from far and wide come to lure euros away from unsuspecting tourists in return for goods freely available in Camden Market. Two hours later, as we are still ploughing our way through the rofe, the local name for the volcanic gravel that lies everywhere, across el Jable, the flat land that links the north and the south of the island, I am beginning to regret not lingering longer in Teguise. This is one of the two parts of the walk I did not enjoy – the other is the ascent of Guardilama volcano but more of that later – but even so the flat and rather boring terrain provides a sense of perspective to the walk. The contrast with the cliff we have flirted with the previous two days could hardly be more stark. Still, if time is at a premium, I suggest this is the part to skip. It is also the longest day’s walk, with over 19.5 kilometres separating us from our ultimate destination at el Cuervo volcano. By the afternoon the terrain has once more changed as we enter the Natural Park of the Volcanoes, and becomes engulfed by lava flows, the largest of which covered some 200 square kilometres, or a quarter of the island. Raquel informs us that the smooth lava flow is called Pahoe-hoe after the Hawaiian word for barefoot, while the sharp lava flows are ‘a a’, reflecting the sound you make if you attempt walking barefoot across them. Alternatively, why not try some Walk Winter Sun in the Canaries. 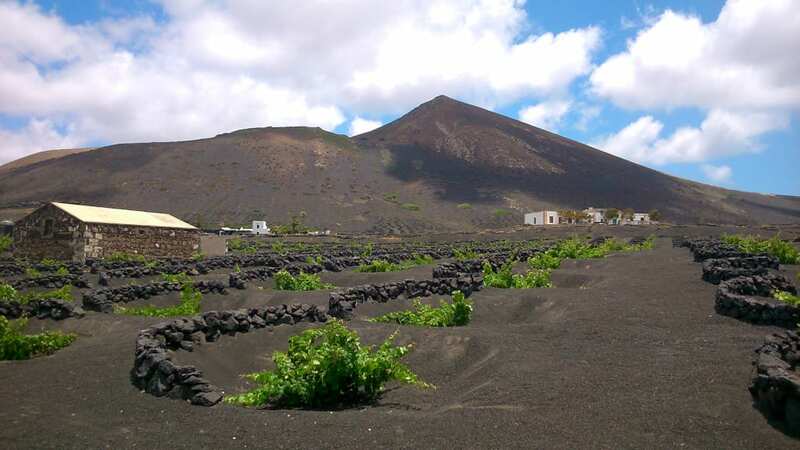 Somehow, the locals manage to grow wine here – this is the Napa Valley of Lanzarote – with the vines cut close to the ground and protected by volcanic rock from the winds for which the island is famed. It is one of these vineyards, El Grifo, where we end the day, enjoying the most wonderful selection of wines and tapas on the tasting menu, richly deserved after our longest day walking in Lanzarote. The following day is our rest day, which I spend exploring the town of Arrieta and its beach, splashing away in the vibrant waves, and ending almost inevitably at Casa de la Playa. Suitably reinvigorated, we start our fifth day’s walking in Lanzarote back at the Natural Park of the Volcanoes. Two days earlier we had walked around the beautiful, red Colorado volcano, and today we enter the adjoining Cuervo volcano. There is something otherworldly about the park. A lunar landscape, this could certainly have been the setting for Capricorn One. 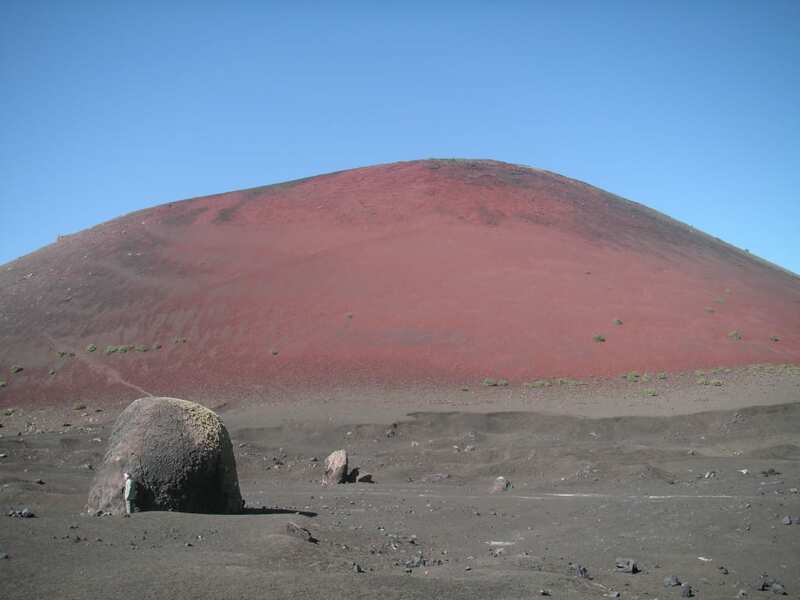 The day is set to be dominated by volcanoes, as we climb to the summit of Guardilama volcano, which at 605 metres is the second highest point in the south of the island. 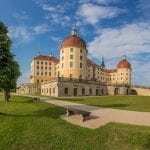 The views from here are spectacular, I am assured, but suffering from a fear of heights I keep my eyes firmly trained to the ground while my co-walkers gather for a group photo at the top. Hang-gliders sail beneath us, as I began to regret taking up the challenge. My legs now acclimatised to walking 15 kilometres up and down volcanoes each day, I feel a tad sad as our walk comes to its natural conclusion. I literally skip down the other side of the volcano, each step ensuring I am closer to safety. However, this is not to prove our final climb of the day as later on we take on the Atalaya de Femes, which is a few metres higher than Guardilama. The views from the top across most of the south of the island as the sun is beginning to set are quite wonderful. I feel totally free as I drift away from my other walkers, but fortunately not over the edge. My legs now acclimatised to walking 15 kilometres up and down volcanoes each day, I feel a tad sad as our walk comes to its natural conclusion. The final day, we enter the Monumento Natural Los Ajaches and walk briefly with some goats along the rugged terrain towards the coast. This is the driest part of the island. It is by some margin the easiest day’s walking in Lanzarote, without even a solitary volcano to ascend. Eventually, Papagayo beach appears in the distance. After a quick celebratory beer, we descend a path to the small beach and enter the waters, our labours now concluded, to soak our aching legs in the cool waves. Five days trekking, across almost 90 kilometres with more volcanoes than beers, our trek is complete. It might not be Land’s End to John o’ Groats but as our group enjoys our last supper back at Casa de la Playa, I feel as if our journey was well and truly rounded. Lanzarote is a beautiful island with a surprising variety of terrain and landscapes, a rich culture and welcoming people. Walking across it allows you to fully take in its charm. Leaving La Finca on the way back to the island, I feel a great sense of achievement. Perhaps, I will walk the length of another island someday, but maybe one with a few less volcanoes. For details of staying with Lanzarote Retreats at La Finca de Arrieta or any other of their properties in Lanzarote, visit here. Alternatively, you can book accommodation in Lanzarote through our Hotel Booking Portal. Blackstone Treks and Tours organises a number of guided walks around the island for two to eight people. The next Walk the Rock will be from 28 November to 6 December, 2019. If you wish to participate then email: [email protected]. For more information about the walk, click here. For more information on the great variety of activities you can get up to in Lanzarote, visit: https://turismolanzarote.com/.